The IBPS Clerk Recruitment process will consist of an online test for both the Preliminary and Mains examinations. The final phase is a personal Interview before the provisional allotment of posting. IBPS Clerk Preliminary Exam is scheduled on 8th, 9th, 15th & 16th December 2018. The Mains Exam for IBPS Clerk 2018 Exam will be conducted on 20th January 2019. IBPS Clerk CWE is conducted every year to select eligible candidates to the post of Clerk by Institute of Banking Personnel Selection Board. Here, we have provided all the details of IBPS Clerk Recruitment 2018-19 in the following sessions. Candidates who are appearing for IBPS Clerk Examination are informed to go through the vacancy list and start preparing for the examination. The following table gives all the information related to the IBPS Clerk Recruitment dates and vacancies. Important things to note are the dates of the prelims and mains examination, the registration dates etc and the candidates need to make sure that these dates are adhered to for the concerned activity. Candidates for IBPS Clerk Recruitment have to qualify in each of the three tests by securing passing marks to be decided by the Bank. An adequate number of candidates in each category decided by the Bank (about 20 times the numbers of vacancies subject to availability) will be shortlisted for the Main Examination. Each test will have separate timing as mentioned above. The candidates are required to qualify in each of the Tests by securing passing marks, to be decided by the Bank. The passing marks in each of the tests will be decided by the Bank on the basis of the performance of all the competing candidates. Candidates are also required to score a minimum percentage marks on aggregate Minimum percentage marks on aggregate will be decided by the bank. The IBPS Clerk Recruitment eligibility criteria given here are the basic criteria’s that need to be fulfilled to apply for the post. Candidates are required to show all the documents to support of their identity and eligibility concerning their nationality, age, educational skills. Application form at the time of seeking the recruitment is required by the IBPS Recruitment organisations. Please take a note that no change of category will be permitted at any stage after registration. Merely appearing for and being shortlisted in the online examination does not imply that a candidate will necessarily be offered employment by any of the Recruiting Organisations. 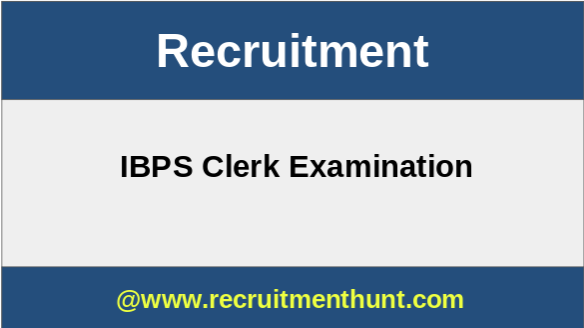 IBPS Clerk Recruitment Candidate should have a Minimum 20 years and Maximum 28 years of age. IBPS Clerk 2018 Vacancies are announced! IBPS has released 7225 state wise vacancies for the post of clerk in 19 participating government banks Check the latest vacancies list to see the number of state vacancies for the IBPS Clerk 2018.